This dosa is so much packed with full flavour. Once you try this will becomes one of your favourite dosa.. Children's will surely like this for its flavour, crispyness and color.. Try it out. If Tomato is not sour add tbsp of Tamarind extract but this gives different taste. 1. 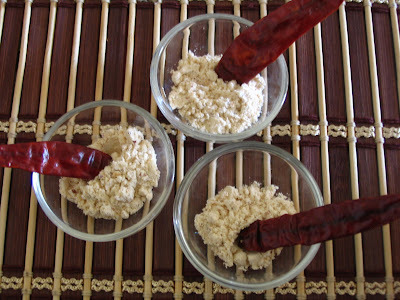 Soak rice for few hours and grind with all other ingredients and salt to fine batter. 2. The consistency should be like rawa dosa consistency that is so loose. 3. Then season with mustard and curry leaves, add the chopped coriander. 4. Heat the skillet and pour a ladle full of batter starting the edges in circular way. 5. Since the batter is loose it auomatically fills the middle part , unfilled part just fill it with ladle. 6. Add 1 tsp oil and cover it with lid , when it turns slight brown in the edges flip it over and make crisp on other side too. 7. Since this dosa itself have good flavour you need not have any accompaniment , but this podi goes well with this one. Powder all the above ingredients and season with mustard and curry leaves. 1. Here the Tomato can be substituted with 1 cup of chopped carrot , but for carrot dosa add little tamarind extract. And coconut is optional for this. Both tomato as well as the tastes so so yummy. 2. If you are using the raw rice for grinding ,when you dilute it use warm water. 3. Batter would taste great next day too. Hi Pavithra, Ur tomato dosa looks perfect and yummy. Who can say no to this yummy b'fast? I'm in...or can I?? and Nags ravishing rice event if you have not exceeded her limit of 5 recipes. Hey Pavithra, As everytime very nice presentation of the dosa..to me it looks nicely "laced" dosa.. I liked it very much. Incredible Presentation.. Dosa looks so crispy..
Aww..u are a dosa maestro..aint it? ?That looks super perfect..! Hey your dosa is looking absolutely amazing..Crispy Crispy kara kara dosa :) And am sure tomato flavour will be great, though I havent tried it.. If I want to try something different for a change, I visit your blog. Your recipes r great ! Wow..very crispy dosa with tomato..
Mmmmhhh, everything looks so good! What pretty dosas! crispy and yummy tomato dosa..
Tomato dosa looks crispy, wat a delicious breakfast..just love the podi:) yummm!!!! 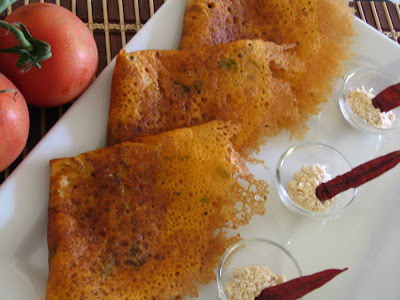 Wow tomato dosa looks so crispy..love your presentation...how do you get such ideas? Lovely Dosa..Looks colorful and crisp o crispy..
first time i'm hearing this recipe ! your mind blowing ! just feel like munching it out of the plate ! gr8 clicks ! this looks so good pavithra...u r a dosa specialist...looking fwd to seeing more dosa recipes..
Thnx for trying the puli channa dear! hav u started the dosa mela again? the red colour looks so attractive. Looks colorful and crispy. Thanks for sending it to the event! Very novel! Will surely try it out this weekend!! Love the look of it! 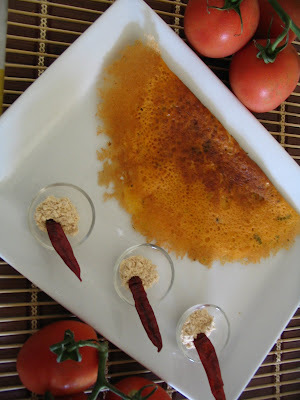 I love tomato dosa - yours looks so lacy and good! Neat recipe. If I decide to use idli rava, do I still need to grind it Pavithra? At first look I thought they were rawa dosas and you had somehow included tomato to the batter.So crisp!!! i have a different version which I would like to share at some point. I shall try this recipe very soon. Wow tomato dosa ...its looks so crispy and delicious ...will surely try this out ..thank u very much for the recipe..
Tomato dosa looks awesome...really delicious. I am booking a ticket to LA soon not to see the place though, think i can lazy around at your place while u cook 7 different dosas for a week...My god you know to cook so many dosas?? I am not gonna tell you which dosa I make...no never. May be instead of tamarind, you can also try sour curd.. amazing!! and u dont need to fermet the batter overnight? Hey Pavi, tomato dosa came great :) Made only few variations as I dont prefer coconut etc..Have posted it in my blog too..Chk it out..
pavithra just made these for breakfast.. came awesome.. i just added tomato puree with other ingrdnts to the dosa batter .. as i dint have raw rice !thanx ! 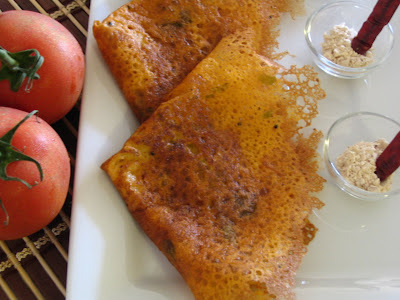 Wow Pavithra, your version of tomato dosai is also mouthwatering.. will try this version also soon! !